Unabashedly, I am a huge Jim Everett fan, and in my mind he was one of the most unheralded quarterbacks from the ‘New Bronze Age’ of football. After Bo Jackson and Tony Casillas both came off the board in the 1986 draft, the Oilers under head coach Jerry Glanville decided to take the #1 quarterback Jim Everett with the third overall pick to compete with incumbent Warren Moon who at this stage of his career was still adjusting to the NFL game. Unable to get Jim signed to a contract the Oilers traded Jim away to the Los Angeles Rams, in exchange for defensive end William Fuller, offensive lineman Kent Hill, two #1 picks (1987 and 1988) and a 5th rounder. The picks later became Haywood Jeffires, Sean Jones (via trade), and Spencer Tillman. The trade henceforth became known as “The Jim Everett Trade” -and it was actually a really good deal for both teams in the end, providing a catalyst for both teams to make the playoffs for years to come. Playing for John Robinson, Everett started 5 games his rookie season and won 3 of those contests throwing for 8 touchdowns and 8 interceptions. After a somewhat rough sophomore season, adjusting to new offensive coordinator Ernie Zampese’s system, Jim took the NFC West by storm in 1988 throwing for 3964 yards and 31 touchdowns (- to only 18 picks) and posted a 89.2 qb rating. 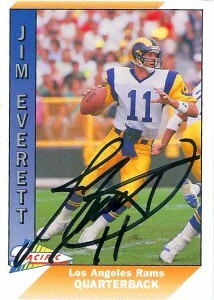 The Rams finished 10-6 under Jim’s leadership and Jim led the NFL in TD throws. In 1989, Everett would again have another banner year, breaking the team record for passing yardage in a season with 4,310 yards and have 29 touchdowns. His quarterback rating of 90.6 in the NFC would be second to only Joe Montana and during this heyday the Rams were the only team in the NFC that could go toe to toe offensively with the 49er juggernaut. Jim’s 1989 campaign also saw him lead the league with 29 touchdown throws. The Rams entered the playoffs as a wild card at 11-5 and battled their way up to the NFC Championship game against the 49ers. They’d lose 30-3, but the worst part about it was, the 49ers exposed the Rams offensive line scheme and Everett had his cage badly rattled. Other teams dissected the 49ers defensive plan and the Rams were just not be able to adjust quickly enough. Under ownership with notoriously tight purse strings, the team made very few free agency moves and many recent draft choices had not panned out. The offensive line was aging, starting running back Greg Bell signed Plan B with the Raiders -It was not a good time for the Rams in 1991, as they would slip to a 5-11 record with 4 losses by 4 points or less, including 1 in overtime. Jim still managed to post a 23-17 Td to Int ratio. After the departure of head coach John Robinson in 1992, offensive coordinator Ernie Zampese and Jim would leave soon after the 1993 season. 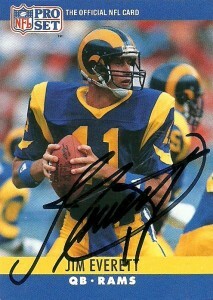 Jim finished his career as the Rams #1 consecutive starter at quarterback and 10th all time at 91 games. Ernie went on to transform Troy Aikman and the Dallas Cowboys offense, while Jim would be traded to the New Orleans Saints for a 7th round pick. 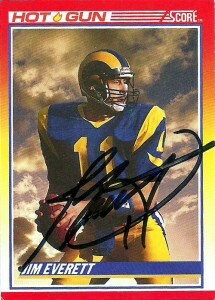 Jim left the Rams as the franchise’s all time leading passer in yards and second in touchdown throws. Under charges that they had intentionally been playing ‘bad football’ and holding back merchandise to make it appear that their sales were suffering- the Rams left for St. Louis after the conclusion of the 1994 season. It would be odd for me to flip on TV during those years and see Jim playing for the Saints, but he wore the colors well and New Orleans had been hungry for a strong armed quarterback since Bobby Herbert had left in 1992. He’d play respectably well for the Saints over the next 3 seasons, before playing one final season as a backup in 1997 for the San Diego Chargers. Jim since retirement has returned to SoCal where he has begun his own asset management business. I had been after Jim’s autograph for sometime and even posted on Fanmail.biz looking for it. I was disappointed when somebody contacted me to try to sell me the autograph. Undeterred I was able to locate his company’s address via the internet and get his autograph on the same day as John Robinson’s in a flat 13 days. This Score 1990 Hot Gun card subset was one of my favorites to look at with its clean edges and neat looking clouds, it was a Photoshop marvel for its time. Over the past few years, I have really tried to get this subset, along with Score 1990’s “Ground Force” signed as they are some of my favorite superhero inspiring cards. Pro Set of course delivered with solid accuracy and setting the bar for other companies to try to outdo. Pacific on the other hand was late to the game only beginning to publish football cards in 1991. There were some interesting elements of the card set, including white borders and vertical type, but despite these innovations, I perceived their set as an expensive and generic one, -only a step up from Topps which was bringing up the rear on quality. The diagonal highlight on the player name also didn’t help and probably would have been better served without it and the type in black. Immortalized in Tecmo Super Bowl Jim was a dangerous quarterback and on the Super Nintendo version under his guidance of the Saints, he was a great clock manager who always found a way to win. I also have his Starting Lineup figurine somewhere as well. 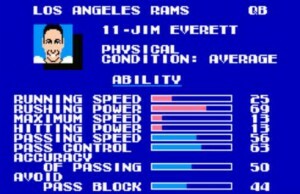 Jim Everett is also known for his on air assault of radio of TV personality Jim Rome in 1994, stemming from the Rams loss to the 49ers in the championship game from the 1989 season. Rome had been calling Everett “Chris” in reference to female tennis player Chris Everett for years and Jim was tired of hearing it. When Everett arrived at the studio to do what he thought was an upbeat interview about the Saints with Roy Firestone, he was shocked to learn he’d been coyly tabbed to go on screen with Rome. As they came on the air, Everett said sternly not to call him ‘Chris’, but Rome persisted causing Everett to jump out of his chair and throw Rome to the ground. It was so sudden that many people to this day claim that it was perhaps staged, however Everett himself has gone on the record numerous times to validate that he was indeed frustrated with Rome’s antics. Understandably, if you are Jim and people remember you for that, -sure you might be amused, but if you are Jim Rome, you probably don’t want to talk about it ever again.